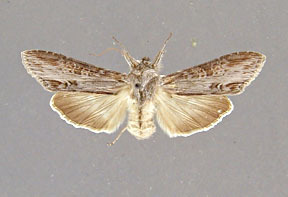 Cucullia asteroides Guenée, 1852, in Boisduval and Guenée, Histoire Naturelle des Insectes. Species General des Lépidoptéres, 6:133. Diagnosis: Cucullia asteroides is characterized by a white hindwing, narrowly margined with dirty brown in males and broadly margined in females. 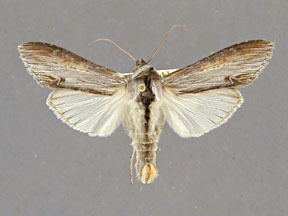 This white base of the hindwing separates it from florea, omissa, and postera, the three species most likely to be confused with it. 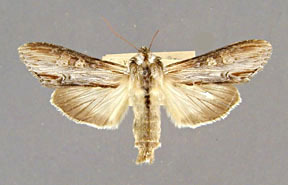 Some specimens of postera have a lighter hindwing base, but it is dirty white. The orbicular and reniform marks of postera are tinged with rusty brown and ringed with dull white but are more obscure in asteroides and not distinctly white ringed. This species is narrowly sympatric with montanae in the western Great Plains. 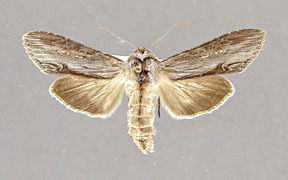 The orbicular and reniform marks of the forewing of montanae are far more distinct than in asteroides and the maculation is crisper and generally more distinct. 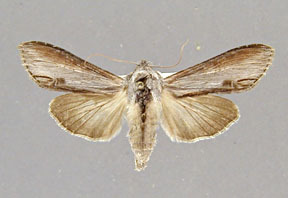 The forewing color of montanae lacks the violet hue of asteroides. There is a single large spine in the vesica of the male genitalia. This spine is borne on a globular, single diverticulum. 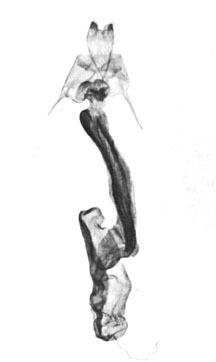 The diverticulum is neither elongate, as in most other species in the group, nor double as it is in similaris and the florea complex of species. A second small diverticulum exists below the larger one. This small diverticulum corresponds to the small diverticulum found in montanae but does not bear a small, second spine as it does in montanae. Wing length from base to apex: mean = 22.77 mm., standard deviation = 1.05 mm., n = 10. 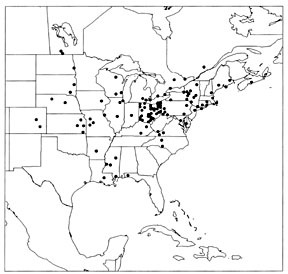 Distribution: This species occurs throughout most of the eastern United States, west to the foothills of the Rockies, and northward into southern Ontario and Quebec. It is apparently more common in the north than in the south, although this may be a sampling artifact. I've seen specimens from Florida and Louisiana. Cucullia asteroides is most characteristic of disturbed, eastern deciduous forest and is replaced in the mixed deciduous conifer forests of northern New England and Canada by omissa, florea, and postera, apparently without much precision. The range of asteroides narrowly overlaps that of montanae in the short grass prairies of the Dakotas and Montana. There is no significant geographical variation in this species. 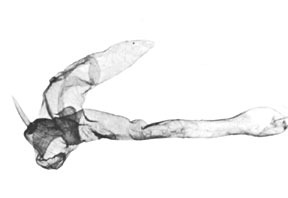 Larva: The larva has been described by several persons including Crumb (1956) and Dethier (1944). The general larval pattern is green or yellow-green with longitudinal dark brown to black lines. The dorsal region is green with two wide, dark bands on either side. 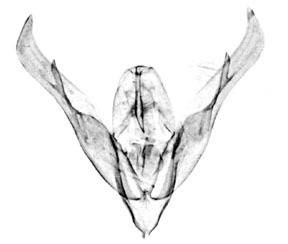 There are two thin lines dorsal to the spiracle and ventral to the subdorsal band. A pair of lines runs above and below the spiracle and this double band is filled with black on the spiracles. There is a thin, subspiracular line ventral to the spiracles. The spiracles have black rims with light centers. The prolegs are green and unmarked. The head is lightly reticulated with red-brown patches. Foodplants: The larvae feed on the flowers of various species of Aster and Solidago (Asteraceae), pupating in the autumn in the ground and emerging next summer as adults.